Taylor was not a trained archaeologist and clearly was unable to publish his finds in a coherent and professional manner. Upon Taylor’s death, the collection has been inherited by his family. Two years subsequently, it is being sold off by auction, rather than donated to a museum, by Taylor’s widow and four children. These are two of my concerns about private collecting in a nutshell. The first is that many artefact hunters we meet online are barely literate, totally incapable of framing their thoughts (such as they are in many cases) in words. I am often criticised as non-'pc' for emphasising that incontrovertible fact. Yet, note who is involved in the barford-bashing, the very same people that want us to believe that artefact hunters are "citizen archaeologists' who are "rescuing (sic) the archaeological record (sic)". You cannot rescue a record by demolishing it into component fragments and not making a record of what you've done. That is simply destruction and knowledge theft. Details of the sale, by Hansons, are on their website. The justification for the sale is that it was discovered before the law of treasure trove (presumably they mean the current Treasure Act). 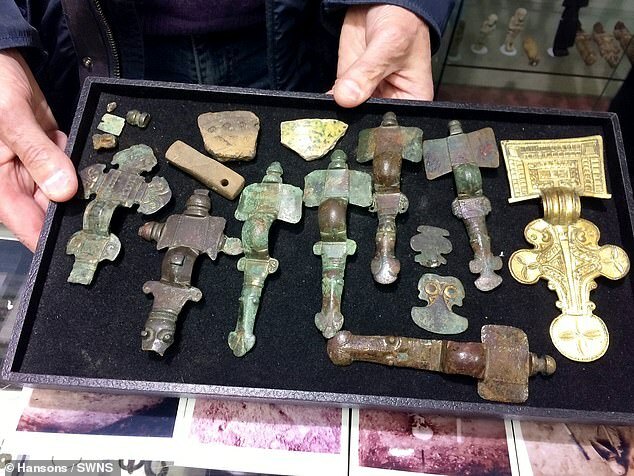 [actually totally irrelevant here PMB] To promote the sale of this regionally important early Anglo-Saxon collection, Hansons Auctioneers, headed up by a television antique celebrity, have sold the story to the Daily Mail. The Hansons website and the Daily Mail article present the site with ludicrous hyperbole: “site has since been heralded as one of the most significant archaeological discoveries of the 20th century.” This is clearly terminology utilised by the auctioneers to boost interest in the sale, as is the likely sale price of £80,000. Indeed James Brenchley, a Hanson’s ‘antiquities expert’ is quoted, describing the sale as a ‘once-in-a-lifetime’ opportunity. Opportunity for what? Not to simply ‘own’ but to ‘work with’, the objects of a ‘carefully and professionally excavated site’. Moreover, they describe the collection as ‘amazing’ and which ‘..help us to understand Anglo-Saxon life with burials taking place over a 200-year period.’ How it does, and might, outside a museum, is difficult to comprehend. The claim is made that the ‘…material is extremely well documented with diary entries and photographs of the excavation.” Together, these statements aim is to foster interest from the archaeological community and museums themselves, and afford a sense of legitimacy to what is otherwise a poorly documented and old imprecise excavation of an early Anglo-Saxon cemetery. And one where the finds are either unlabelled or now mixed up. A tray of a jumble of mixed and unlabelled brooches and other items is held out to the mail's camera. 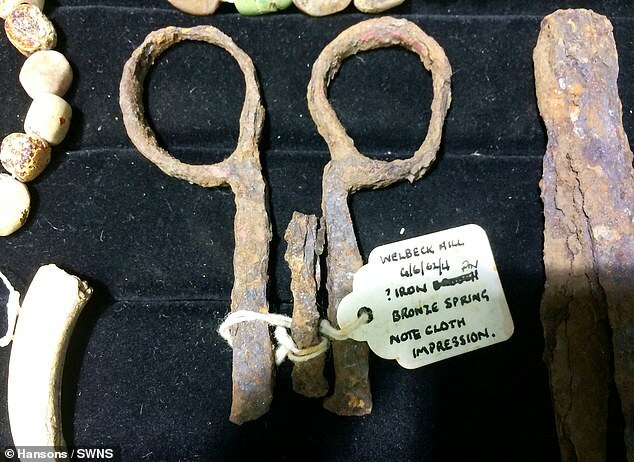 Fragments of a pair of scissors (probably in fact intrusive) have a label that seems to have come from a brooch. The importance of the finds is framed unsurprisingly in terms of ethnic nationalism in the Daily Mail: ‘These objects were made and used by some of the first Englishmen’. The wife and son of Taylor are photographed holding choice finds, one of which may well have been a cinerary urn. Presumably the cremated human remains within have never been analysed or have long been disposed of? As well as the gross promotion of the Daily Mail, Hansons Auctioneers have thus far supported the sale with a series of poorly articulated attempts at humour in tweets that also contain some inaccuracies. More broadly, this case clearly reveals a duo (at least) of horrors that are hard to fully accept about the treatment of artefacts and human remains in the UK today. First, the horror that human remains can be legally sold in the UK is something I’m aware of, but still can’t fully contemplate and many others must find this legal situation intolerable too. Second, the horrific nature of the British antiquities trade and their high-profile use of the media to promote sales of both human remains and antiquities, including their lack of apparent ethical guidelines. The old addage about good manners costing nothing and bad manners costing your reputation could not be more apt, nor more ironic. The one trait that unites you with many of your detractors is a degree of rudeness and lack of respect for views of other's that differ from your own. It entirely undermines your cause and is massively damaging to the chances of sensible discourse or your being successful in pursuing an agenda for change. This is a blog about collectors of archaeological artefacts, not for them. I really do not see much reason to be "polite" about people who dig up over seventy human graves in order to scatter the bones and take for themselves the objects mourners had respectfully placed in those graves and then attempt to gain personal financial profit from the exercise. If you see this as praiseworthy and totally uncontroversial behavior, then backslap away. But do not expect everyone to have the same "respect" for what amounts by these acts to be grave robbing as you apparently think is deserved here. I am criticising "not best practice". My "detractors" are criticising me for criticising "not best practice" - there is the difference. I see no real possibility of "sensible discourse" with those that see this as a kosher way to treat the archaeological record - they will not be persuaded or cajoled into accepting that this is wrong, and will argue about their own (selfish) "rights". You cannot discuss anything on these grounds when they will continue to refuse to see that they trample over those of others. Who, though, we can reach are the rest of the public who can see that this is very, very wrong, and remove the shield of respectability and public acceptance from this kind of activity - precisely by placing it beyond the pale. You carry on backslapping and cajoling and hoping things will change some time in the next twelve decades, I'll carry on telling it like it is here and now. OK? The 'Curse of Sekhemka' Strikes Again?